How I Became a Hare Krishna: Subuddhi Devi Dasi ~ The Toronto Hare Krishna Temple! The Toronto Hare Krishna Temple will be featuring an ongoing series on our website about how active members of our community became practitioners of the Hare Krishna faith. Written by Krishna Rajesh, a young high school student in our community, this series will share devotees' personal stories of how they became Hare Krishnas! Please share your encouraging words and feedback with a comment! How does one begin to realize that their life is lacking something? How do they realize that they are in fact searching for something? And most of all, how do they find it? For many of us, day to day life seems dry, if not full on boring and miserable. Some of us have our families to support us through life, and others have other means of relieving themselves. But some search for something more; a better, if not a more permanent solution. Some sort of soul-searching. A journey to find that one thing that will make our lives seem meaningful. For many in the ISKCON community, this journey is what led them here; to become a practitioner of the Hare Krishna faith, where they are surrounded by seemingly unending spiritual bliss at all times. Such was the story of Subuddhi Devi Dasi as well. 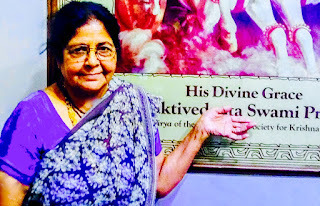 Subhuddi Devi Dasi (previously known as Subash Taneja and affectionately known as Mother Subuddhi) was born into an originally Krishna conscious family. 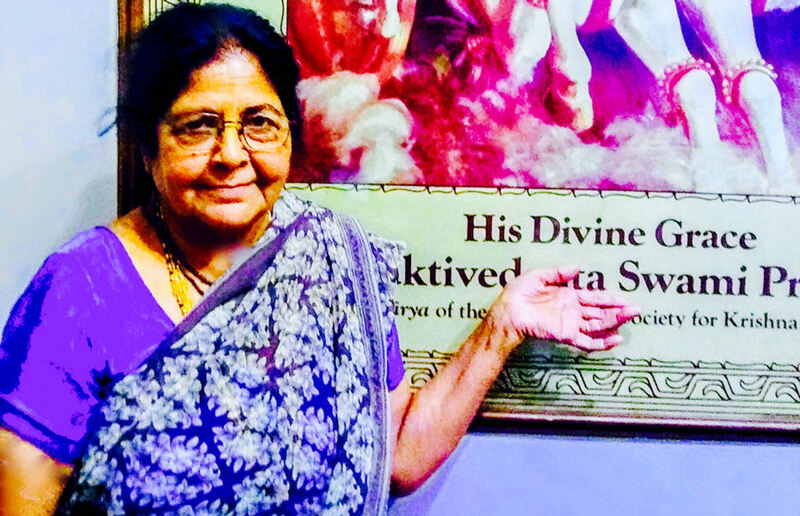 She had learnt to follow the traditional ways of a Vaishnava life from her childhood. But just like the many people who come from similar backgrounds, she had not fully understood the meaning behind Krishna consciousness; let alone appreciate it for what it is. Things had begun to change for her when she came to Canada in 1971. She became aware of the emptiness that was within her, and realized that she was desperately looking for something to make her feel whole. One day, at a store, while working as a cashier, when she noticed one devotee, wearing saffron colored clothes, holding a packet of milk in one hand and a Krishna story book in the other. “As soon as my eyes went on Krishna’s book, I said ‘Oh my god! Krishna in Canada? !’”, said Mother Subuddhi, during an interview while reminiscing about it. This fateful encounter with a devotee soon led to her discovery of the temple, which at that time was located at 187 Gerard Street, around the end of September, 1971. Mother Subuddhi, along with her husband, then drove up to the temple. At a first glance, they were surprised. Her husband then decided to knock the door, and see for himself if this was truly a temple. To his pleasant surprise, he was greeted by a nice lady, dressed in a white saree and wearing tilaka; the symbol of a Vaishnava which adorns the forehead, along with a bindi and a nose stud. With a gentle smile, she greeted him saying “Hare Krishna!”. Mother Subuddhi then realized that what she was desperately looking for, to fill up the hole within her had been found. And that was ISKCON. Ever since then, she has been regularly coming to the temple. She says that the temple is her life and breath. She comes to the temple two to three times a day, continuously doing different services and looking for other ways to contribute to the temple. She believes that she gets the opportunity to do so because of Srila A.C. Bhaktivendanta Swami Prabhupada’s mercy. He is the founding Acharya of ISKCON and is also Subuddhi Devi Dasi’s spiritual master. He is also the one who gave Subuddhi her spiritual name, after getting initiated (a rite of passage for practicing Hare Krishnas). She likes to do service and she is very passionate about it. And she is happy to serve the Deities, the temple, and the devotees. She says it motivates and keeps her going. It is her connection to Krishna. And she is always inspired by how the Krishna conscious movement has changed so many lives from all over the world. Subuddhi Devi Dasi’s story is one of the many life stories that have been changed and revolutionized by ISKCON and Krishna consciousness. Great articles. Heartfully Thanks for the postings.